WATER IS LIFE chapter 3 – THE INAUGURATION OF OUR WATER WELL! Our water well is ready! Another drinkable water source is now available in Ethiopia: you are finally able to bear the fruits of your support! 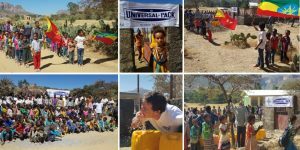 In the beginning of November we inaugurated the water well built with the funds allocated by Universal Pack during Interpack 2017 in the village of Gereb, Tigray region, in Ethiopia. A gesture as simple as laying a piece of Water is Life puzzle at Universal Pack booth became a social action to improve life conditions of around a thousand people. And this is only the beginning! The village inhabitants, some representatives of Universal Pack and local institutions participated in the event, hosted in a joyful and friendly atmosphere celebrating the new drinkable water source for a couple of days. Now that fight for survival is less hard, adults will have the chance to work and children to go to school. But that’s not all. This well is just the beginning; it’s a piece of a mosaic of initiatives aimed on improving life’s conditions of those who live in the poorest regions of the world. Many projects are at stake for the present and the future, because just as we bring packaging machinery in the most remote regions of the world we wish to contribute to the development of who lives in worse conditions than ours. The collaboration between Universal Pack and Progetto Familia Onlus started a few years back and is constantly growing; the commitment in the same Asian and African territories together with the common will to go beyond business made the relationship between these two realities grow stronger, and perpectives for the future are very positive. We have many current projects, and many more are coming.